Hosting their first show of 2019, the show will host close to 100 tables of sports cards, memorabilia, artwork, novelties and more, focusing on the Philadelphia sports community, along with featuring 4 autograph signers, autograph authentication, free kids card breaks, and many other giveaways and surprises. 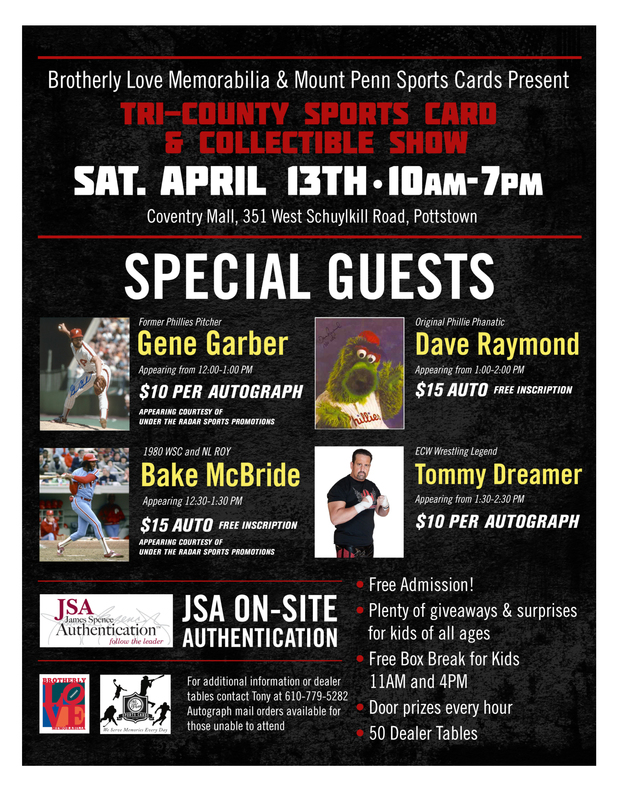 Pottstown, PA, April 09, 2019 --(PR.com)-- Brotherly Love Memorabilia & Mount Penn Sports Cards have teamed up to bring you the first Tri-County Sports Card & Collectible Show of the year taking place this Saturday, April 13th, 2019 at the Coventry Mall in Pottstown from 10 AM until 7 PM EST. Admission is free and will host over 100 dealer tables, featuring a variety of sports and entertainment cards, collectibles, and memorabilia. There will also be door prizes, free kids cards breaks, and other giveaways to kids of all ages. James Spence Authentication services will be on hand to authenticate autographs. Jordan Spector, a world renowned sports artist, who has done custom work for the likes of Eagles legend Brian Dawkins, and current 76er star Tobias Harris and others, will be on hand during the event. The Philadelphia Sports Table, the regions longest running Philly related sports podcast, will also be on hand to chat sports and shop with many of the dealers and special guests. The show will not lack the presence of autograph signers. 1980 Phillies World Series Champion Bake McBride, former Phillies and Braves pitcher Gene Garber, ECW Wrestling Legend Tommy Dreamer, along with the Original Philly Phanatic and inspiration behind the Flyers mascot Gritty are all scheduled to appear. "Brotherly Love Memorabilia's mission with hosting this show is simple, bringing the hobby back to the average fan," says Christopher Huey. "Autographs will be a nominal $10 to $15, and while they may not be the hottest names in sports, most people easily recognize their contribution to the sports world. There will be something at this show for everyone, from the novice collector to the those that have collected for decades, and at all price levels." Christopher goes on to mention that Brotherly Love Memorabilia will be hosting two free card breaks for the kids attending the show. "There is nothing more important to me than getting kids back into the sports card and collectible hobby. I grew up being able to attend card shows with my dad and could afford buying 36 count wax box for $20-30. Nowadays, a kid is lucky to get a pack for that." He also states that there will be a large container of baseball cards in the kids break area, that kids of all ages can dig through and keep any cards they find, some even containing a sticker for a prize. Additional shows in 2019 are planned for July, October and December, with exact dates and times to be determined.